Milligan partnered recent signing Ryan White in the middle as a close contest was anticipated, with just three points separating the sides in Hallmark Security League first division north. AFC were boosted by winning their first game of 2019, against Daisy Hill, but the West Yorkshire club had much the better of the first half and created several good chances. However, the AFC defence was resolute as Fran Donaghy made a series of vital tackles. But he could not prevent Steeton taking the lead five minutes before the interval, when Aaron Hollindrake hooked the ball into the far corner of the net. AFC improved in the second half but appeared to lack that killer instinct in front of goal until defender Jake Darnell headed home powerfully from Milligan’s corner 10 minutes from time. 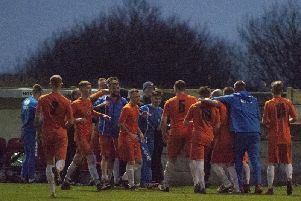 Blackpool remain 14th, with Steeton now just one place above them, and manager Martin Baird said: “We are disappointed in our performance, which was a step back from Daisy Hill. I think a draw was a fair result. “Our creativity in the final third needs to be worked on but it will take time to achieve our goals. It shows character to get a late equaliser. It was a great delivery by Jamie and a great header from Jake.